thank for providing this tuto. It’s really a great offer!. 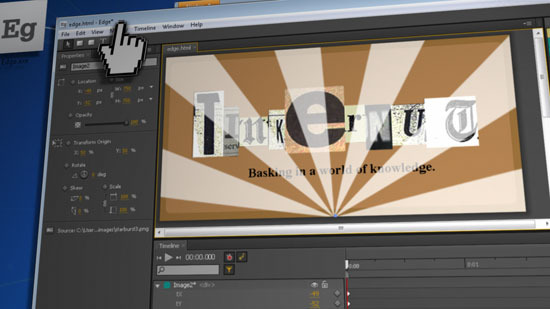 This tutorial rocks,especially considering that i work in flash to make my websites. this will help me a ton while making a mobile version of my website. I can’t opet,can someone help me? Were are the downloadable files at? Am using Firefox on Ubuntu Linux 10.10. Any ideas why this video doesnt play? The window for the video opens but then freezes with just the play icon, pressing doesnt do anything… was looking forward to this and leaving Flash behind… unless its something “obvious” of course… hence the post… thanks in advance! Please check out http://www.edgekingdom.com for more Adobe Edge forums and tutorials! Thanks for the post – this is awesome!